 University of National and World Economy is the largest as also the eldest higher educational institution of Economics in Bulgaria and Southeastern Europe and it has a history of 90 years. University originates from the Free University of Political and Economic Sciences (FUPES) established by Order № 2155 of July, 5th, 1920 of the Minister of national education. In 1940 (by State Gazette, iss.№ 126 of June, 7th, 1940) it has been transformed into State Higher Institute of Finance and Administrative Sciences (SHIFAS) and then in 1947 it has been reorganized as a Faculty of Economic and Social Studies under Sofia University. The autonomy of the University has been restored under the name Higher Institute of Economics (HIE) by Decree № 26 ("Messages”, iss. № 10 of February, 1st, 1952). In 1953 it was called Karl Marx by Decree №89 (" Messages”, iss. № 23 of March, 20th, 1953). On April, 27th, 1990 the Academic Council has made the decision Karl Marx Higher Institute of Economics to be reorganized as a University of National and World Economy. That has been officially done by a Decision of the National Assembly for the establishment and transformation of the higher educational institutions (State Gazette, iss. № 68 of July, 7th, 1995).